For other uses, see The Drifters (disambiguation). Ahmet exited Birdland like a shot and headed directly uptown. He raced from bar to bar looking for Clyde and finally found him in a furnished room. That very night, Ahmet reached an agreement with McPhatter under which Clyde would assemble a group of his own. They became known as the Drifters. Wanting to blend gospel and secular sounds, McPhatter's first effort was to get members of his church group, the Mount Lebanon Singers: William "Chick" Anderson, Charlie White, and David "Little Dave" Baughan (tenors); David Baldwin (baritone, and author James Baldwin's brother); and James "Wrinkle" Johnson (bass). After a recording session of four songs on June 29, 1953, Ertegün realized that this combination didn't work and had McPhatter recruit another lineup. The second group included first tenor Bill Pinkney (of the Jerusalem Stars), second tenor Andrew Thrasher, and baritone Gerhart Thrasher (both of the gospel group "The Thrasher Wonders"), Willie Ferbee as bass vocal, and Walter Adams on guitar. This is the group on the second session which produced their first major hit, "Money Honey", released September 1953, with the record label displaying the group name "Clyde McPhatter & the Drifters". McPhatter was barely known during his time with the Dominoes, and he was sometimes passed off as "Clyde Ward, Billy's little brother". In other instances people assumed it was Billy Ward doing the singing. "Lucille", written by McPhatter, from the first session, was put on the B-side of "Money Honey", making a recording industry rarity; a single released with two songs by two essentially different groups of the same name. "Money Honey" was a huge success and propelled the Drifters to immediate fame. More lineup changes followed after Ferbee was involved in an accident and left the group. After Adams died, he was replaced by Jimmy Oliver. Ferbee was not replaced; instead, the voice parts were shifted around. Gerhart Thrasher moved up to first tenor, Andrew Thrasher shifted down to baritone, and Bill Pinkney dropped to bass. This group released several more hits, including "Such A Night" in November 1953, "Honey Love" June 1954, "Bip Bam" October 1954, "White Christmas" November 1954, and "What'cha Gonna Do" in February 1955. McPhatter received his draft letter in March 1954; however, as he was initially stationed in Buffalo, New York, he was able to continue with the group for a time. "What'cha Gonna Do", recorded a year before its release, was McPhatter's last official record as a member of the Drifters, although his first solo release ("Everyone's Laughing" b/w "Hot Ziggety") was from his final Drifters session in October 1954. After completing his military service, McPhatter pursued a successful but relatively short-lived solo career with 16 R&B and 21 pop hits. McPhatter demanded a large share of the group's profits, which he had been denied in the Dominoes; however, on his departure, he did not ensure that this would continue for his successor. He sold his share of the group to George Treadwell, manager, former jazz trumpeter, and husband of singer Sarah Vaughan. As a result, the Drifters recycled many members, none of whom made much money and got paid a mere $100 a week (US$935 in 2018 dollars). McPhatter later expressed regret at this action, recognizing that it doomed his fellow musicians to unprofitability. McPhatter was first replaced by original member David Baughan, who had been singing lead in concert while McPhatter was in the service. Baughan's voice was similar to McPhatter's, but his erratic behavior made him difficult to work with and unsuitable in the eyes of Atlantic Records executives. Baughan soon left the group to form the Harps (1955) (finding his way back into Bill Pinkney's Original Drifters in 1958), and was replaced by Johnny Moore (formerly of The Hornets). During September 1955 this lineup recorded an R&B hit with the A side "Adorable" reaching number one and the B side "Steamboat" going to number five. These were followed by "Ruby Baby" in February 1956, and "I Got to Get Myself a Woman". Low salaries contributed to burnout among the members. Bill Pinkney was fired after asking Treadwell for more money. In protest, Andrew Thrasher left as well. Pinkney formed The Flyers with lead singer Bobby Hendricks, who would leave to join the Drifters the next year. Pinkney was replaced by Tommy Evans (who had replaced Jimmy Ricks in The Ravens). Charlie Hughes, a baritone, replaced Andrew Thrasher. Moore, Evans, Gerhart Thrasher, and Charlie Hughes got a top ten hit in 1957 with "Fools Fall In Love" (number 69 Pop and number 10 R&B). Moore and Hughes were drafted in 1957 and replaced by Bobby Hendricks and Jimmy Millender. By early 1958, the lineup was: Bobby Hendricks (lead tenor), Gerhart Thrasher (first tenor), Jimmy Millender (baritone), Tommy Evans (bass), and Jimmy Oliver (guitar). This lineup had one moderate hit, "Drip Drop" (number 58 Pop), released in April 1958. With declining popularity, the last of the original Drifters were reduced to working the club scene and doing double duty with gigs under the Coasters and the Ravens names. By May 1958, both Hendricks and Oliver had quit, returning only for a week's appearance at the Apollo Theater. During that week, one of the members got into an argument with the owner of the Apollo, Ralph Cooper. Treadwell fired the entire group. After the argument with Cooper, Treadwell hired a group called the Five Crowns and renamed them "The Drifters". Although Treadwell owned the Drifters brand, original members felt they were the real Drifters and were determined to keep the group alive. Bill Pinkney left first. After receiving exclusive and irrevocable ownership of the name/mark "The Original Drifters" in a binding arbitration, he joined with the Thrashers and David Baughan to begin touring as "The Original Drifters". Several original Drifters came in and out of this group over time, as well as other new artists, but these Drifters never replicated the success of the earlier Drifters group. Baughan left after a short time. Bobby Lee Hollis joined in 1964 and took over the lead spot. Later that year, Andrew Thrasher left and Jimmy Lewis joined the group. Bobby Hendricks returned, making the group a quintet for a short time, before Lewis' departure. Andrew Thrasher returned, replacing Hollis. Hollis and Baughan were periodically with the group through the 1960s. In 1968 the group consisted of Pinkney, Gerhart Thrasher, Hollis, and Hendricks. Pinkney hired the Tears to perform as part of his group on a short tour. The Tears were Benny Andersson, George Wallace, Albert Fortson, and Mark Williams. After the tour, the Tears—without Pinkney—continued to tour as the Original Drifters, but Pinkney successfully sued to stop them from using the name. Pinkney added Bruce Caesar, Clarence Tex Walker, and Duke Richardson, but the lineup changed rapidly. In 1979 the group was Pinkney, Andrew Lawyer, Chuck Cockerham, Harriel Jackson, and Tony Cook. Their 1995 album Peace in the Valley on Blackberry Records credited vocals to Pinkney, Cockerham, Richard Knight Dunbar, (Vernon Young), and Greg Johnson. They appeared on the 2001 PBS special Doo Wop 51 with Pinkney, Dunbar, Johnson, and Bobby Hendricks. The lineup in the early 2000s was Pinkney, Cockerham, Dunbar, Young, and Ronald Jackson, the son of singer Ruth Brown. Pinkney died on July 4, 2007, and his legacy continues via the successfully defended registered federal service mark "Bill Pinkney's Original Drifters". The present Original Drifters lineup is Russell Henry, Chuck Cockerham, Richard Knight Dunbar, and Roger Whitehead. Treadwell owned the rights to the name "Drifters" and still had a year's worth of bookings for the Apollo when he fired the group. In summer 1958, he approached Lover Patterson, the manager of the Five Crowns featuring lead singer Benjamin Earl Nelson—better known by his stage name of Ben E. King—and arranged for them to become the Drifters. The new line-up consisted of King (lead tenor), Charlie Thomas (tenor), Dock Green (baritone), and Elsbeary Hobbs (bass). James "Poppa" Clark was the fifth "Crown"; he was not included due to an alcohol problem, which Treadwell had considered to be a problem with the first group. The group went out on the road to tour for almost a year. Since this new group had no connection to the previous Drifters, they often played to hostile audiences. When Atlantic decided to send the new Drifters into the studio, Ertegün and Wexler were too busy to produce the sessions, so they hired Jerry Leiber and Mike Stoller, who had been successful producing the Coasters. With Leiber & Stoller producing, this new lineup — widely considered the "true" golden age of the group — released several singles with King on lead that became chart hits. "There Goes My Baby", the first commercial rock-and-roll recording to include a string orchestra, was a Top 10 hit, and number 193 on the Rolling Stone 500 Greatest Songs of All Time. "Dance with Me" followed and then "This Magic Moment" (number 16 on the Billboard Hot 100 in 1960). "Save the Last Dance for Me" reached number 1 on the U.S. pop charts and number 2 in the UK. It was followed by "I Count The Tears". 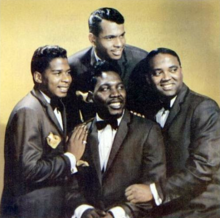 This version of the Drifters was inducted into the Vocal Group Hall of Fame in 2000 as Ben E. King and the Drifters. The write-up indicates an award primarily as a tribute to Ben E. King with a nod to his time in the Drifters, only one of five paragraphs being exclusively devoted to the Drifters, although Charlie Thomas was also cited by the Rock and Roll Hall of Fame (and the Vocal Group Hall of Fame's induction of the original Drifters, which technically was only through 1958). With this brief golden age lasting two years, personnel changes followed. Lover Patterson (the Drifters' road manager) got into an argument with George Treadwell. Since Patterson had King under contract, he refused to let him tour with the group. King was only able to record with the group for about a year. Johnny Lee Williams, who sang lead on "(If You Cry) True Love, True Love", the B-side of "Dance with Me", handled the vocals on tour along with Charlie Thomas. When the group passed through Williams' hometown of Mobile, Alabama, Williams left the group. Williams died on December 19, 2004, at the age of 64. When King asked Treadwell for a raise and a share[clarification needed] of royalties, a request that was not honored, he left and began a successful solo career. Williams left at the same time and a new lead, Rudy Lewis, (of The Clara Ward Singers), was hired. Lewis led the Drifters on hits such as "Some Kind of Wonderful", "Up on the Roof", "Please Stay" and "On Broadway", which reached number 5 on the U.S. pop singles chart and number 4 on the U.S. R&B singles chart in 1963. Lewis was also named in the Rock and Roll Hall of Fame Drifters induction. Ben E. King died on April 30, 2015, at the age of 76. Hobbs was drafted for military service and replaced by the returning Tommy Evans (from the first group). Green left in 1962 and was replaced by Eugene Pearson (of The Rivileers and The Cleftones). Evans left again in 1963 and was replaced by Johnny Terry, who had been an original member of James Brown's singing group, The Famous Flames (and was co-writer of their first hit, "Please Please Please"). After his military service and a failed solo career, Johnny Moore returned in 1964, making the group a quintet of Moore, Thomas, Lewis, Pearson, and Perry. Later that year, the group was scheduled to record "Under the Boardwalk" on May 21. But Rudy Lewis died on the night before the session, and Johnny Moore took over as the sole lead (he and Lewis had been alternating). Terry was replaced in 1966 by Dan Dandridge for a couple of months, then by William Brent, who had been with Johnny Moore in the Hornets in 1954. Gene Pearson was replaced by Rick Sheppard during the same year. By late 1966, baritone/bass Bill Fredricks had replaced William Brent. Charlie Thomas, the group's last member from the Five Crowns, left in mid-1967 and was replaced by Charles Baskerville, a former member of The Limelites. Baskerville stayed only a short time. In 1972 the Drifters left the Atlantic roster. The Drifters moved to England and continued with several different vocalists. They had hits on the U.K. charts with "Like Sister & Brother", "Kissin' in the Back Row of the Movies", "There Goes My First Love", and "You're More Than a Number in My Little Red Book". Butch Leake and Grant Kitchings of The Ink Spots replaced Sheppard and Thomas. Fredricks was replaced by Clyde Brown during the next year, and Kitchings by Billy Lewis the year after. Leake was replaced by Joe Blunt in 1976, making the lineup Johnny Moore, Clyde Brown, Joe Blunt, and Billy Lewis. Faye Treadwell renamed the group's management company Treadwell Drifters Inc.
Moore left in 1978 and was replaced by Ray Lewis. Blunt and Billy Lewis left in 1979 and were replaced by the returning Johnny Moore and former Temptations lead Louis Price. Moore left again in late 1982, along with Clyde Brown. They were replaced by two returning members, Ben E. King and Bill Fredricks. Fredricks, Lewis, and Price all left in 1983 and were replaced by the returning Johnny Moore, Joe Blunt, and Clyde Brown. In 1986, the group split up, and a new lineup was constructed by Treadwell, consisting of new member Jonah Ellis and former members Ray Lewis, Billy Lewis, and Louis Price. During the next year, more former members came in as replacements, making the group Moore, Billy and Ray Lewis, and Gene Jenkins (replaced shortly after by George Chandler, then John Thurston). Ray Lewis was out in 1988 and was replaced by Joe Cofie. In 1989, Billy Lewis left and was replaced by the returning George Chandler, then Tony Jackson, Keith John, and Peter Lamarr in 1990. Thurston was out at the end of the year and was replaced by Roy Hemmings. Patrick Alan was in for Peter Lamarr briefly before Lamarr left in 1991 and was permanently replaced by Rohan Delano Turney. Johnny Stewart joined the group in 1963 and left in 1993 in Las Vegas. He joined The Platters and continued his singing career. This lineup lasted until 1996, when Cofie was out and Jason Leigh was in. Leigh was replaced after two years by the returning Lamarr. Leigh returned on the next tour and Lamarr was replaced by the returning Patrick Alan. On December 30, 1998, the group's longest-serving member, Johnny Moore, died in London. Patrick Alan returned to the group, keeping it a quartet. In 2001, Faye Treadwell left the United Kingdom and apparently abandoned the Treadwell Drifters franchise although in January 2000 a US court had overturned a 1999 jury verdict declaring that it was abandoned. Two members of her company, Mark Lundquist and Phil Lunderman, started a new management company, Drifters UK Limited, to run the group. Their new duties included stopping a trademark by a UK group calling themselves American Drifters. Lamarr left again in 2003 and was replaced by Victor Bynoe. Hemmings left in 2004 and was replaced by Peter Lamarr. The group's lineup as of 2007 was Peter Lamarr, Rohan Delano Turney, Patrick Alan, and Victor Bynoe. On June 20, 2007, this lineup performed at Prime Minister Tony Blair's Farewell Party in London. In 2008 Tina Treadwell won her case in a UK court establishing her ownership of the Treadwell Drifters franchise, so this lineup lost the right to use the Drifters name. In 1969, magazine editor Larry Marshak planned a series of concerts by the Drifters and other classic vocal groups. He found Dock Green, Charlie Thomas, and Elsbeary Hobbs and began to promote them as "the Drifters". This brought swift legal action from Faye Treadwell, wife of George Treadwell, who was managing the Drifters. In an attempt to grant his group the sole rights to the name, Marshak convinced Hobbs, Thomas, and Green to apply for a trademark on the Drifters name in 1976. The trademark was granted, but due to Treadwell's legal action it was revoked in 2000 in U.S. Federal Court. The trio of original Drifters split afterward into separate groups. The Truth in Music Advertising laws were legislated in 34 of the 50 US states from 2005 to 2014 to stop promoters such as Marshak from assembling new groups of musicians and marketing them as well-known groups such as the Drifters. In December 2006, writs were served in the London High Court by Tina Treadwell, daughter of George and Faye, against Mark Lundquist and Philip Luderman Drifters UK Ltd, alleging they are not the rightful controllers of the Drifters. In July 2008, The Treadwell family and Prism Music Group Ltd won their legal battle. The court order prohibited Phil Luderman, Mark Lundquist, Rohan Delano Turney, Peter Lamarr, Patrick Alan or Victor Bynoe from using the Drifters name. Ownership of the Drifters name continues with the Treadwell family in the form of George Treadwell's daughter, Tina, and the UK-based company Prism Music Group Ltd. The line-up features Michael Williams, Pierre Herelle, Ryan King and Carlton Powell. The Drifters lineup performed at the London IndigoO2 Arena in 2009 with special guests the Drifter Legends, made up of some of the most prestigious former members of the group. Lifetime Achievement Awards were presented at this concert to Joe Blunt and Butch Leake by Neil Martin from Sony Music and songwriter Roger Greenway. In 2012, gold discs (100,000 units sold of Up on the Roof, The Very Best Of) were awarded by Sony Music to Butch Leake, Joe Blunt, and Clyde Brown. This is the only lineup, with the exception of Johnny Moore, to have recorded on both of the group's former labels, having recorded new material on Atlantic/Warner in 2009 and on Sony Music in 2011. Dock Green led his group, the Drifters featuring Dock Green, throughout the 1970s and 1980s. That group consisted of Dock Green (lead/baritone), Derek Ventura (lead/tenor), Lloyd Butch Phillips (second tenor), and Bernard Jones (bass/baritone). Green died on March 10, 1989; Phillips died in 2002. Ray Lewis and Roy Hemmings have led a Drifters group. Bobby Hendricks led a group, as did Billy Lewis. Don Thomas leads a group, Don Thomas and the Drifters Review. In addition, Ronn McPhatter, son of Clyde McPhatter leads a group called Clyde McPhatter's Drifters. Aside from the official post-2008 lineup, Treadwell managed a second group, The Drifters Legends, composed of former members Rick Sheppard, Butch Leake, Joe Blunt, and Clyde Brown. Faye Treadwell died of breast cancer at the age of 84 on May 22, 2011. The Vocal Group Hall of Fame has inducted both "The Original Drifters" (1998) and "Ben E. King and the Drifters" (2000). In 2004, Rolling Stone ranked the Drifters #81 on their list of the 100 Greatest Artists of All Time. In 1988, the Rock and Roll Hall of Fame inducted the Drifters; naming members Clyde McPhatter, Bill Pinkney, Gerhart Thrasher, Johnny Moore, Ben E. King, Charlie Thomas, and Rudy Lewis. Bill Pinkney, Charlie Thomas, and Johnny Moore (posthumously) received Pioneer Awards from the Rhythm & Blues Foundation in 1999. The Songwriters Hall of Fame include The Drifters among their Songwriters Friends, the artists who popularized the songs written by inductees. Rhythm & Blues Hall of Fame 2018. Bobby Charles Taylor August 13, 1940 - (passed away on October 14, 2018 in Moreno Valley, California). ^ Josephine, Deiry. "Terry King – Biography". Solo Creators. Deiry Josephine. Retrieved November 5, 2015. ^ a b "The Immortals: The First Fifty". Rolling Stone Issue 946. Rolling Stone. ^ "Treadwell Presents The Drifters". TheDrifters.co.uk. Archived from the original on December 3, 2013. Retrieved September 29, 2015. ^ a b c d "The Drifters (Inducted 1998)". Vocalgroup.org. Archived from the original on October 31, 2013. Retrieved September 29, 2015. ^ a b "Ben E. King and the Drifters (Inducted 2000)". Vocalgroup.org. Archived from the original on March 4, 2016. Retrieved September 29, 2015. ^ "The Drifters: inducted in 1988 | The Rock and Roll Hall of Fame and Museum". Rockhall.com. Retrieved May 10, 2012. ^ Honkers and Shouter: The Golden Years of Rhythm and Blues. New York: Crowell-Collier Press. 1978. p. 382. ^ a b c d e Chance B (28 March 2015). "Clyde McPhatter Story Pt 1 on Soul Facts Show" – via YouTube. ^ "The Drifters Official Website – Discography". thedrifters.co.uk. Archived from the original on 10 May 2008. ^ a b "The Drifters – Biography & History – AllMusic". AllMusic. Retrieved August 5, 2017. ^ Nick Talevski Rock Obituaries – Knocking On Heaven's Door – 2010 Page 163 0857121170 1981 A member of The Drifters, Tommy Evans was one of three dozen vocalists who would pass through the ... Evans appeared on the 1957 Johnny Moore-led Drifters hits: 'It Was A Tear', 'Hypnotized', and 'I Know', as well as the 1958 Bobby ..."
^ "Soul Music HQ The Drifters". Soulmusichq.com. Retrieved May 10, 2012. ^ Furness, Hannah. "Stand By Me singer Ben E King dies at 76". Daily Telegraph. Retrieved May 1, 2015. ^ Warner, Jay (2006). American Singing Groups: A History from 1940s to Today. Hal Leonard Corporation. pp. 164–. ISBN 978-0-634-09978-6. Retrieved 14 January 2019. ^ Pierre Perrone (6 January 1999). "Obituary: Johnny Moore". The Independent. ^ "The Drifters, Tony Milton, Ray Charles, Leiber and Stoller, Impressions". Soul Music HQ. Retrieved May 10, 2012. ^ "United States Court of Appeals for the Third Circuit, MARSHAK V. TREADWELL, paragraphs 22 and 23" (PDF). Typepad.com. Retrieved August 5, 2017. ^ "IN THE MATTER OF APPLICATION No. 2335371 BY THE AMERICAN DRIFTERS TO REGISTER THE TRADE MARK AMERICAN DRIFTERS IN CLASS 41 AND IN THE MATTER OF OPPOSITION" (PDF). Patent.gov.uk. Retrieved September 29, 2015. ^ "The Drifters Official Website – The Drifters Family Tree". thedrifters.co.uk. Archived from the original on 1 July 2007. ^ "Mark Lundquist News, The Drifters at the PM Party". MarkLundquist.com. Retrieved September 29, 2015. ^ "The Drifters triumph in court case". Music Week. ^ NME.COM. "The Drifters win legal battle". NME.COM. ^ "The Drifters featuring Doc Green". Retrieved September 29, 2015. ^ "TRADE MARKS ACT 1938 (AS AMENDED) AND TRADE MARKS ACT 1994 IN THE MATTER OF APPLICATION No 1502341 BY TREADWELL's DRIFTERS INC TO REGISTER A TRADE MARK IN CLASS 41 AND IN THE MATTER OF OPPOSITION THERETO UNDER No 47459 BY WILLIAM HENRY LEWIS" (PDF). Patent.gov.uk. Retrieved September 29, 2015. ^ "Clyde McPhatter's Drifters – Continuing the legacy of The Drifter's Founder". Cmdrifters.com. Archived from the original on September 30, 2015. Retrieved September 29, 2015. ^ "The Drifters – The Official Web Site of The Drifters – Drifters Legends". thedrifters.co.uk. Archived from the original on 23 June 2012. ^ Richard Williams. "Faye Treadwell obituary | Music". The Guardian. Retrieved September 29, 2015. ^ "Artists". Songwriters Hall of Fame. Retrieved May 10, 2012. ^ Josephine, Deiry. "Terry King – Discography". Solo Creators. Deiry Josephine. Retrieved 5 November 2015. "The Drifters". Rock and Roll Hall of Fame.